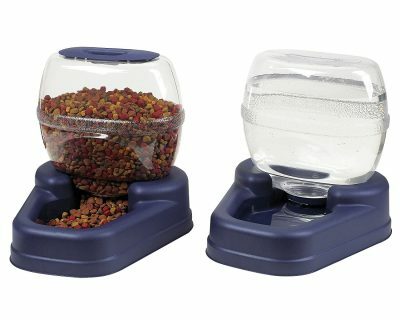 (4/5)The Bergan Feeder Petite Combo comes with a food dispenser and a waterer, both wide enough for your pets to eat and drink for several days. 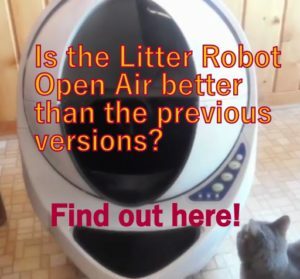 Their sturdy design prevents your pets from tipping the units over. Bergan Combo comes in two sizes: “Bergan Petite” suitable for cats and small dogs and “Bergan Elite”suitable for larger pets. The large version Bergan Elite dispenses up to 13 lbs of food and the waterer dispenses up to 3 gallons of water. 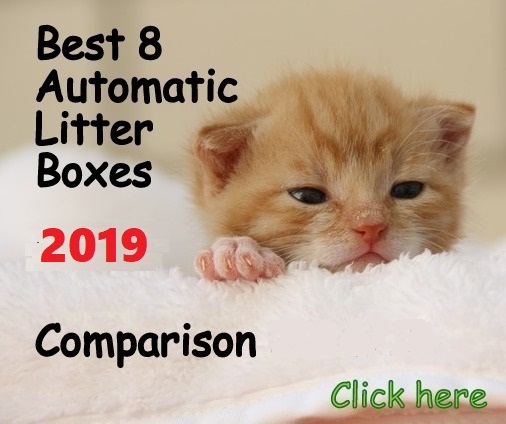 The dimensions of the Elite version are 15.25″ H x 14.25″ W x 16.63” L. This particular review is for the Petite feeder and waterer combo, suitable for cats and small dogs. Water dispenser has a capacity of 1.5 gallons. Bowl has a good capacity, approx. 1 cup dry food. The waterer lid features a small flip top to pop it open once assembled onto the base. 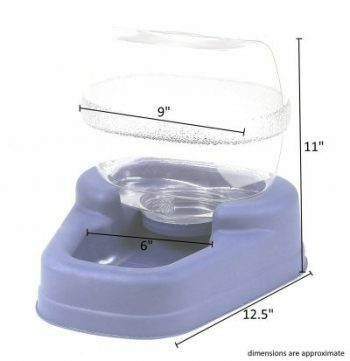 Dimensions are 11.25″ H x 11″ W x 12.5″ L.
The Bergan Petite Combo includes a food and water dispenser, each one consisting of a base and a container. The base features a slot to lock and secure the container and a tilted surface towards an indentation that acts as a bowl. This smart design with a slope on the inside base provides a better reliability to refill the food and water bowl when needed. The base and the container or hopper are detachable. The Bergan feeder offers a wide opening on the top to refill without spilling and the water dispenser features a single spout to avoid water from overloading. To fill the waterer you need to fill the container from the bottom, put the lid on, open the small flip top on the lid, and flip the container over to put it on the base. 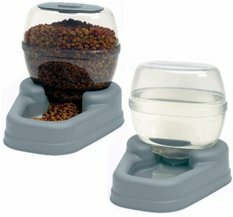 The Bergan Petite feeder and water dispenser are gravity feeders which means they don’t dispense automatically or with a programmed schedule. Through gravity the food and water are dispensed slowly into the base as the pet eats or drinks. The bases (bowls) of the feeder and waterer are refilled as they get empty. For this reason you need to make sure your cat is not overweight if you are going to feed your single cat with type of feeder. 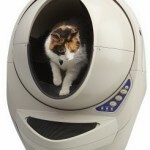 The Bergan Petite is also suitable for multi-cat households. WHAT ARE THE PROS AND CONS OF BERGAN PETITE GOURMET COMBO? Eliminates the hassle of changing out food and water every day. Excellent to feed 2 or more cats. Gravity dispensing system does not allow to set up a feeding schedule. Some customers report that the food dispenser does not automatically fill the bowl when empty. Some customers report that water dispenser leaks. Clear plastic is thin and doesn’t snap in the bowl correctly. Feeder top lid does not snap into place and it is hard to get it off. The food and water are exposed to the elements, the design is not ant-proof. To fill the water dispenser it’s better to fill the container and assemble it while being upside down, then flip it over. 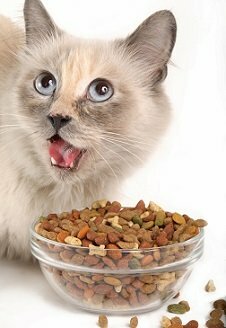 If your cat is food motivated, it could easily push the food that is stuck in between the container and the bowl and get food to drop to keep eating. This could overcome the “con” about the food not dropping. Bergan Feeder Petite Gourmet and the waterer Combo is made to feed and give water to several pets. The waterer needs special attention since the water bowl gets dirty quickly and the tank develops some bacteria if not cleaned often. 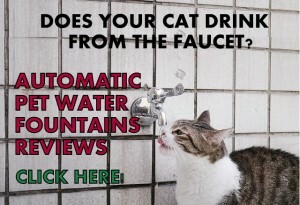 If you want to feed several cats that are also heavy water drinkers. If your main goal is to eliminate the daily task of pouring food and water. 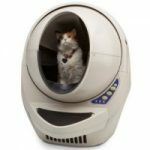 If you want to rest from your cats for one or two days. 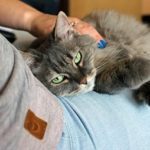 If you have picky cats when it comes to eat and drink water. 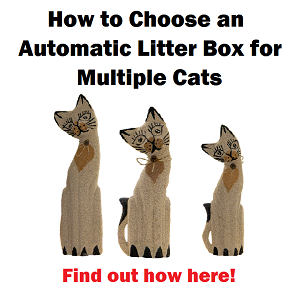 If you want to buy it to feed only one cat. If you want a feeding schedule for your pets. If you want to use it outdoors. We feed our cats like that. We always have food and water down for them. It would be nice not to have to always be putting out food and water for them. They certainly let us know when they are out of water or food, let me tell you what! I know, they are not shy when it comes to complain about food or water lol! You know they work fine but sometimes they don’t work for everybody the same, it depends of the type of pet. the only reason I’d use this is if I went away for a day or two. If this just keeps pouring out food when the bowl is empty that will be a problem for cats with dietary restrictions. I’d like one with portion control. thanks for the review. You’re right Lisa. 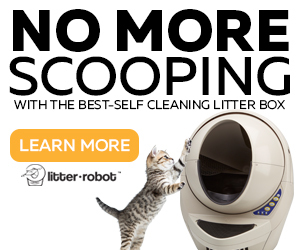 That is one of the cons of this product for people who wants a feeding schedule for their pets. Thanks for sharing. 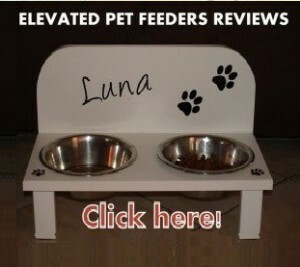 I have a smaller gravity feeder similar to this one for my cats food now and it never has gotten stuck (3lbs). Does this one? I will be going out of town for 11 days and need something reliable. Is this one recommended?? 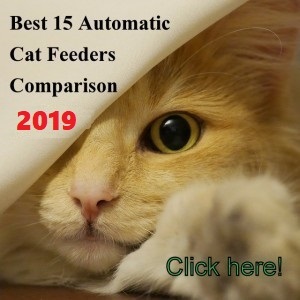 Hello Kayla, even though Bergan Feeder is a good gravity feeder I would not recommend it for 11 days out of town without any supervision, especially if you feed your cats irregular shaped cat foods.